A show which takes youngsters on a journey around the world is coming to the Castle theatre, Wellingborough. Audiences will see how the contents of a magical trunk can tell a story of adventure and friendship. The show gives young audience members the chance to join in, creating animal sounds and even acting out some of the characters. It takes in Egypt, India and places closer to home. Puppetry, music, performance and projections are all used, along with the contents of the trunk, to create landscapes of all kinds as well as an array of exotic creatures. 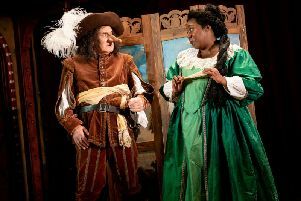 The company says it aims to make the theatre more accessible and enjoyable for children, and pitches its productions to appeal to mixed abilities and a range of cultural backgrounds. Trunk Tales is on Saturday, February 7. Tickets are priced £5 for adults, £7 for under 16s and there is a special offer of one adult free with every under 16. Tickets can be purchased by calling 01933 270 007 or online at www.thecastle.org.uk. The show is suitable for youngsters aged four and above.